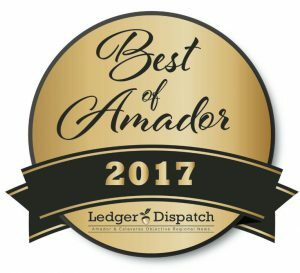 Jackson – Sutter Amador Hospital staff members and Sutter Family Medicine were both chosen as the ‘Best of Amador” in the Ledger Dispatch’s 2017 reader poll. Best nurse: Joey Ouilhon, R.N. Best doctor: Thomas Bowhay, M.D. Honorable mention: Robert Hartmann, M.D. Congratulations to the physicians, nurses and care center that were recently recognized by local voters as the best providers in the area as part of the Ledger Dispatch’s annual survey. The Best of Amador includes categories ranging from the best breakfast spot to the best community-oriented business, giving locals a chance to weigh in on all their favorites. Thank you to the Jackson community for voting us the Best of Amador for 2017.